"Y/n... I need you to do it for me." Stefan said as he crouched down in front of me, the unwavering gaze of the vampire in front of me  making me even more nervous. "But I don&apos;t want to he&apos;s scars me" I sighed. "I know y/n but I need you to do for me... I&apos;ll keep you safe I promise." Stefan stroked my cheek and smiled. "But what if Klaus finds out?" I whimpered. "Don&apos;t worry y/n even if so, he&apos;d never hurt you." He hummed, tapping the end of my  nose and walking over to where Damon was smirking at him. "Here I was thinking you were the good one." Damon snickered. "We need leverage on Klaus and he likes y/n enough to follow her around." Stefan shrugged. "Still, toying with the Hybrid&apos;s heart doesn&apos;t seem like the safest plan." Damon cocked an eyebrow but Stefan simply watched you sitting where he&apos;d told me to. "Good job she adores you." drink down and retreated to the other end of the bar. "Hello Klaus." I say as he sat next to me. "Well aren&apos;t we friendly today." He eyed me carefully before smiling at me, seeming happy when I  happily returned the smile. Eventually I  left the bar and headed to the shops, Klaus following after me  as I  tried to keep calm. He spent the entire day charming me  and attempting to make me laugh, i couldn&apos;t help but feel sorry for the poor Hybrid&apos;s attempts when my mind wondered to Stefan&apos;s plan. Stefan smiled to himself as he went to Klaus&apos; meeting place. While he knew Klaus thought he had the upper hand there was no way he&apos;d figured out that I  was actually in love with him, Stefan had made sure to get closer to me while I  were luring Klaus in. After all he didn&apos;t want me  to suddenly betray him for the allure of the Original. "Stefan always a pleasure." Klaus&apos;s tone was tight and irritable. "Why am I here Klaus?" 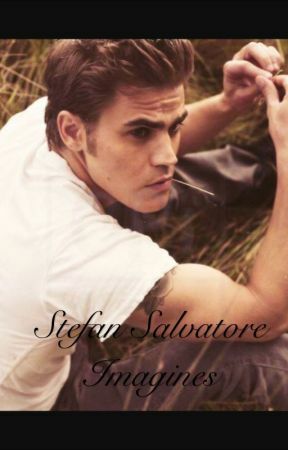 Stefan sighed. The two vampires talked for hours, the tension between the growing as negotiations and plans went nowhere. Finally, Stefan couldn&apos;t take it anymore and he stood, glaring at Klaus who had smug smile plastered on his face. "I&apos;ll tell y/n You said hello." Stefan tried to keep a straight face as Klaus smile began to fade. "She didn&apos;t tell you?" "Tell me what?" Klaus snapped and began almost bristling. "That she&apos;s not in love with you." Stefan smirked at Klaus. "Well it takes work to charm a girl like y/n." Klaus hid his disappointment behind his bitter tone. "Not at all Niklaus, in fact she was so willing to help me all I had to do was ask." Stefan chuckled as Klaus began to lose his composure. "For once you played the sweet gentleman but I was always ahead of you." "You&apos;re lying." Klaus snapped quickly. "She told you you kept following her home after she left your dates, that&apos;s why she smelt like me." Stefan watched the anger flicker through Klaus&apos;s eyes. "Exactly what I told her to say, you know she actually felt guilty for playing you and almost gave me up... we both know how easy it is to play a girl&apos;s heart and all I had to do was convince y/n all I wanted was her." "You used her." Klaus growled out. "Don&apos;t pretend you wouldn&apos;t." Stefan snapped back. "Not something as sweet and innocent as y/n" Klaus was now beyond furious, of all the treasures he&apos;d seen in his long life i were by far his favourite. "Deliciously sweet but a little less innocent when I was done with her, I had to make her forget your kiss somehow." Stefan watched as Klaus seemed to explode. The thought of Stefan roughly draining me felled Klaus&apos;s anger even more and he could no longer control himself, the satisfying sound of Stefan breaking in his hands had him slowly pulling through his haze and looking at the unconscious vampire. y/n that was the play remember?? To get him angry and see if he actually cares for you so we can do it again when we need to!!" He getting upset. And I look At him and then at Damon. "You know I&apos;m a original as well don&apos;t you??" I say angry. And he nodded his head saying. "Yes.." And then I compelled him to tell me the truth. "Tell me the truth were you just playing me??" I ask. And he said "No it&apos;s not true I&apos;m not playing you." He answered. "Then what do you feel for me??" I say a tear falling down my face. "I think your the most wonderful, beautiful girl I have ever meet... And I love you.. I would do anything to protect you from harm" he said causing me to smile and kiss him. And I said "I love you to Stefan Salvatore"